What does a map tell you? | Are We Really Better Together? I have some question for you, dear reader: Have you ever considered the effect a map has on how you think about the world? How big is Africa actually? And how does that connect to Scottish independence? Those of you who are navigationally challenged probably try not to think about maps at all but we are constantly exposed to images which depict the world, and country, we live in. I am not ‘navigationally challenged’, I am in fact fairly adept at map reading and have never, ever been lost in my life. Temporarily navigationally displaced perhaps, but never, ever lost! (And if you believe that one I have some snow I would like to sell you; guaranteed to remain frozen until it melts.) But the one lesson all serious map readers are taught or learn by osmosis is that the ‘map is not the territory’. A map is a graphic representation, a depiction, of a place or space which assists our understanding of that place or space. A badly drawn map can be worse than no map at all as it gives one a false sense of understanding which can lead us badly astray. So ‘how does this relate to Scottish independence?’ I hear you ask. One of the ways is that it has given us all in the UK a completely skewed idea of the relative size (and therefore importance) of the constituent parts of the nation. Most think that Scotland is a wee place up the north and that the vast bulk of the landmass of the UK is the southern counties of England. Nothing could be further from the truth. Bella Caledonia started it with Honey, I shrunk the country, then Michael Greenwell took up the reigns; In response to Honey… ; Honey…again ; and Honey…for the umpteenth time. I have no idea what your opinion of Africa is but do you think that your view, whatever it is, has been influenced by how large it appears on the world maps you have seen, but maybe not really noticed, all your life? How do you think your perception of Scotland may also have been distorted from reality? Especially as so many people from the Central Belt have never been north of Perth, never mind Inverness. How many can accurately place Aberdeen – Europe’s Oil Capital – on a map? How many of you realise just how far north Shetland and Orkney are because they (especially Shetland) generally inhabit a small box placed in the North Sea just to the east of Inverness and just to the north of Fraserburgh (see the maps posted above for the Northern Isles true position relative to the Scottish mainland). The reasons behind the way maps are drawn is a complex one and those of you who are interested I suggest you take a look at the following Wikipedia articles for a start: 1) Map Projection; 2) Gall-Peters Projection; 3) Mercator Projection. Suffice to say, depicting a curved surface such as the Earth’s surface onto a flat piece of paper is a complex task and there is no way to draw an undistorted view of the whole world without drawing it on a globe, and globes are not very easy to carry around in your pocket or pin to a wall. Many of the projections that are used have a certain amount of artistic licence applied to them to make them look ‘just right’ and I challenge you to look at the next image without finding it incredibly jarring to your brain. It just looks wrong, doesn’t it? 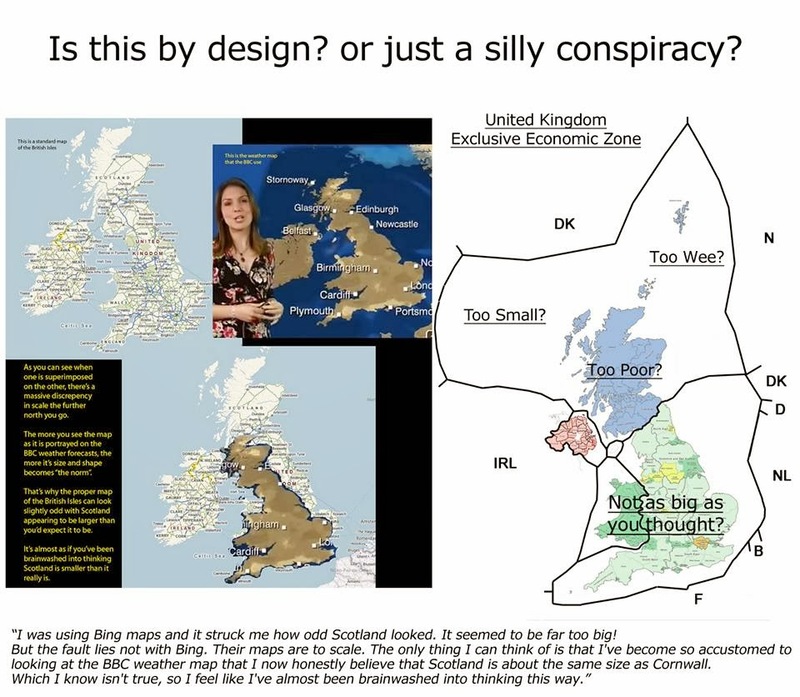 So next time you look at a map of the UK showing Scotland, ask yourself if it looks ‘just right’ or whether in fact it is a distortion of reality. You can then ask yourself if you think it is a deliberate ploy to appeal to the public in the south of the UK and denigrate those in the north (because southern and northern England are just as distorted as Scotland is) or whether it is unthinking artistic licence. But if it is simply unthinking, what do you call a person (or group of people – because it is endemic across UK society and not just the preserve of the BBC or ITV weather presenters) who ignores and fails to consider everyone around them? Selfish? Arrogant? Dismissive? Self-centred? Nothing positive anyway. This entry was posted in Better together, independence, no scotland, politics, referendum, yes scotland and tagged africa, better together, education, independence, maps, no scotland, politics, scotland referendum, yes scotland. Bookmark the permalink.